Charles joined the Thinkspace team at the beginning of 2017 as a senior technologist. His 22 years of architecture experience is augmented by his experience in wood frame construction and finishing, multimedia production for the aerospace and industrial industries and IT systems design, implementation and management. 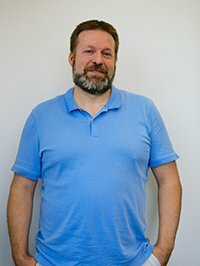 From his humble beginnings on a farm in rural northern Alberta, and a Building Construction Technology program in Victoria, Charles has been involved on a large range of projects with experience not only in producing CAD drawings, 3D models and renderings, but also in production and project management. Though seniors assisted living and care facilities, residential and mixed use residential/commercial projects make up the bulk of Charles resume, his experience extends to government buildings, medical offices, restaurants and resorts. Some of the seniors care and assisted living projects Charles has been involved with include the Suncreek Village (care), Granville Gardens (assisted living), Swedish Canadian (assisted living), Gateway (assisted living/care) and Fairhaven Vancouver & Burnaby (affordable seniors rental). His mixed use project experience ranges from The Jervis (high-end residential tower with social housing podium) to the Uptown project in Coquitlam (two residential towers with a Safeway). Chemanius Family Eye-Care, Seton Optometry and Elena’s Medi-Spa are among his medical office project experience. Dring his time in Ottawa, Charles managed retrofits and accessibility remediation to numerous buildings for the Government of Canada including the Public Archives and National Library and East Memorial Building. Other projects in Ottawa included Canada Space Agency’s David Florida Laboratory, the Arnprior Library, a John Howard Society half-way house, the Black Dog Bistro, Giovanni’s Restaurant and a Scott Street mixed-use project. Charles is a power user of Vectorworks, Sketchup, AutoCAD & Chief Architect and is well versed in Thea, 3D Studio Max, Maya & Blender and other software applications use in multimedia production from graphics/ layout to audio/scores to animation/compositing. On a personal note, Charles is a retired ice hockey goalie and has a passion for music and the recreation of ethnic cuisine. Charles enjoys making custom made sausages and Habanero hot sauce to pastas and breads of any kind.